How to advance in this career? Even though the clan family wields hereditary power, there are other people, groups and factions who also have a lot of influence. The basic division is commonly named the Tent and the Hall. The army command comprises the Tent. The leader of the Tent is the ignaf the top military strategist and the top political advisor to the agni. The ignaf usually holds the second position in the clan, even above the hym (oldest daughter of the agni), especially but not exclusively if she is under-aged. The ignaf also often serves as regent in the absence of the agni. The Tent also includes the assistants and students of the ignaf. Moreover it includes the sogns (top ranking officers, we usually use the English equivalent: general). The number of the sogns is dependant on the size of the army and the clans needs and traditions. The Hall refers to the institutions of civil power. The way the Hall works is individual to each clan. The agni can have a council which she appoints herself out of all the clan members or some special pool of clan members. The council positions may also be determined by the law, so people who perform certain top duties automatically are also appointed to the council. The council may also have a form of a parliament, which is elected by everybody or by a selected group of citizens. Thus the size, composition and exact duties of the Hall vary from clan to clan. There can also be a third group the Temple. Depending on the traditions of each clan the religious authorities may be a part of the Hall, but they may also form a completely separate source of power and influence. The names for all army titles and ranks are unisex. The Tent is often divided farther into the Maps (or Tent Proper) and the Field. The Maps are the ignaf (the main strategist and closest advisor to the agni), between 3 to 6 nboak ignafs (assistant strategists) and some ses u ignafs (trainee strategists). While the ignaf must be a specialist both in the military and political strategies, to become and stay a nboak one may choose just one of these fields. Though specialising in just one field means also that the person will never become the ignaf. To enter this career and become a ses u one needs to be chosen by the ignaf or one of the nboaks (the ignaf often has the final say in their choices as well). Then the chosen one studies for a few years under the eye of one's mentor. Initially the training is mostly theoretical and there are tests, for which one receives points. Later on one also earns points for helping with battle plans or even doing individual tasks. Because the number of nboaks is limited the ses u often wait a long while before one of the nboaks retires, is dismissed, switches clans or dies. Sometimes the ses u has a good enough record to easily become a nboak, but there is no position available in their clan, so they might change clans. Changing clans at that point is still acceptable and not uncommon. Switching clans later on is risky business. Usually it is perceived as treason. Becoming one of the Maps is considered one of the highest possible distinctions. Even the ses u are usually compensated and respected. If one is unhappy with the current clan one may try to leave it but permissions to leave are not given very often, especially if one plans to switch to the neighbouring clan. Still clans often try to steal the best nboaks and ignafs, promising wealth and protection. When one switches clans one is to expect visits from assassins from the previous clan. The Maps shouldn't participate in combat, they have distinctive insignia which differentiates them from the rest of the army. The Huzsan War Codex states that Maps shouldn't be killed only captured and released later if a ransom is paid. If they choose to participate in the battle they should change clothes, because a party riding with a Map would in theory have an unfair advantage and according to the War Codex that would be in very bad taste. Thus the Maps rarely die in battle. Because they are not supposed to be killed openly the most efficient Maps are constant targets for enemy assassins even in times of peace. This term usually refers to the officers, who fight with the army, but may also refer to the army as a whole. The numbers above are as they are stated in the War Codex, so they depict how things should be, but obviously such perfect arrangements are rare. The War Codex is a group of documents regulating Huzsan warfare. It has been designed centuries ago and is enforced by the Allmother, whose main job is to be the arbiter between the clans. 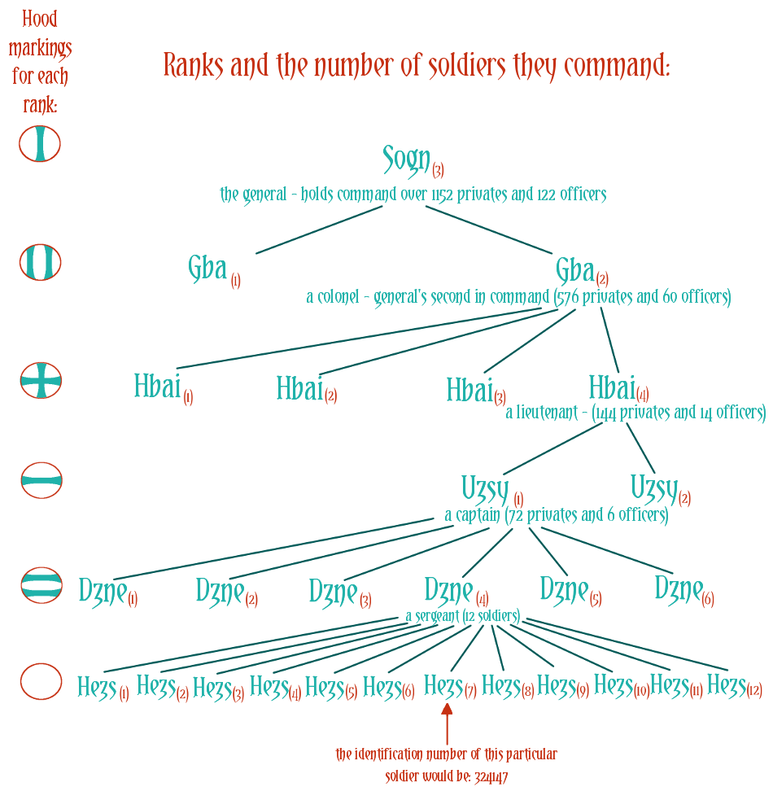 These writings define the structure of Huzsan military: the types of troops and the number of soldiers assigned to each rank, the markings of each rank (symbols on the hoods) etc. They also outline the laws and rules of war. For instance how long a war can take, before the Allmother intervenes. One of the rules set by the War Codex is the soldier identification system. The Tent is obliged to keep very detailed registries. Each soldier has a number, which is henna tattooed on his or her back, so the command can easily check who died in battle and how many soldiers are there in total. These documents also include performance records of each soldier. The abridged copies of the registries are also sent annually to the Allmother's War Office, so she can keep track of the military power of each clan. The identification numbers comprise of 1 to 6 digits. Below possible numbers for each rank. This means that the sogn's identification number would be a single digit, the gba's would comprise of 2 digits - the number of their general and their own number 1 or 2 - and so on. The hezs's identification number comprises of 6 digits showing his or hers direct chain of command up to the sogn. When a hezs is promoted to a dzne their identification number changes and this is recorded. If possible the registries are amended after every battle which yielded fatalities. Each year after a copy is made for the Allmother the registry is marked as closed and filed to the archive. A new one should be started each year. If the registries are kept properly even years later one can follow a career path of numerous individuals. The Huzsan military, as well as its tax system, legal system and citizenship system are quite bureaucratic affairs - all this, obviously, for the benefit of the Allmother. Types of Sogn's and types of units. The clan security sogn - this one is responsible for palace and city guards, constant security for important areas (like natural resources sites) and basic border check points, especially on the trade routes. It is a very politically loaded function and this is the only member of the Tent, other than theIgnaf, who will regularly attend the Hall meetings. Other sogns don't bother under normal circumstances. This sogn traditionally holds the 1 in the military identification system. So consequently the number of every troop of theirs starts with 1. Uene is initially (as of the beginning of the comic) a security dzne, her number is 11416 : 1(her sogn) 1(her gba) 4(her hbai) 1(her uzsy) 6(her own number as dzne). The navy sogn - this one is responsible for the fleet if the clan has any. Not all clans are situated by the sea. Traditionally, if this positions exists, this sogn holds the 2 in the military identification system. So consequently the number of every troop of theirs starts with 2. The cavalry sogn - this one is responsible for all the mounted units, usually the typical Huzsan light cavalry. This sogn holds the 2 in the military identification system (or 3 if there is a navy sogn). So consequently the number of every troop of theirs starts with 2 (3). In the story Gamizs is a cavalry sogn and his army identification number is 2 - Gdezsu has no shoreline. Haibne has an long shoreline so their cavalry sogn holds number 3. The archers' sogn - this one is responsible for all projectile hurling units, usually the archers. This sogn holds the 3 in the military identification system (or 4 if there is a navy sogn). So consequently the number of every troop of theirs starts with 3 (4). The infantry sogn - this one is responsible for all the foot units. This sogn holds the 4 in the military identification system (or 5 if there is a navy sogn). So consequently the number of every troop of theirs starts with 4 (5). There can be more sogns if the clan can or needs to support a bigger army. Any other sogn just gets the first next available digit regardless of what type of general they are. The typical types of units are : border patrols, specialised security units, palace guards, city guards, reconnaissance units, reconnaissance ships, big and small naval battle units, light cavalry, chariots, battle elephants, light and heavy infantry, archers, siege specialists, demolition specialists (the Huzsans fondly use explosives). In Huzsa soldiers have some special privileges. Apart from typical battle training the army provides also general education. Each hezs is taught to read, write, read maps, navigate with the help of the sky and basic maths. This is necessary due to the bureaucratic nature of the military. The soldiers hold a special place in the Huzsan society, this the only group exempt of the general rule that only women can own property. Men in the military can accumulate wealth and freely manage it without taking a family into account. People in the military, both men and women usually do not start their own families and are not dependant on their mother's or sister's family. The military sometimes offers the quickest and most spectacular way of social advancement. The higher ranking officers, from hbai up, are very respected by the society. But there are certain downsides. Borders at this point in history are rather fluid and border skirmishes are common. There are also skirmishes due to several clans laying claim on a particular natural resources spot, like a mine for instance. Thus there is a high chance of actually dying or sustaining crippling injuries. Getting a promotion is not that easy either. One needs to show a great deal of talent and not die in the process. And, even if one gets to the top there is no sitting around pushing pencils, the sogn rides with his or her troops into battle and is expected to show exceptional skill and courage. Some people retire from the military while being rich and respected, but not that many. While the War Codex preaches the promotions should be based solely on merit, such an idealistic approach does not translate seamlessly into practice. The reason for that may be specific clan politics, when people from certain backgrounds are far more likely to be promoted - like for instance the agni's relatives. More often the reason is very trivial, people from wealthy backgrounds who know they will enter this career path learn martial arts from early childhood. Gamizs(but also Aio) is a perfect example of that. His training started early so by the time he was old enough to enlist his skill far surpassed that of most other hezses' and he advanced more quickly. The promotion requires mastering the theoretical skills (reading and writing etc.) as well as excelling in martial arts and showing leadership and team building potential. These all can and should be learned of course, but natural talent often is what tips the balance. Unrelated to the above the army may also be the first step on a completely different career path. A vast majority of people joining the military are 'excessive' children. People whose families were not able to support them, there was no place or work for them in the household and the relatives did not have enough money to provide them with a ses u buy-in to some workshop. Apart from providing an income the army also teaches people a variety of skills. Not only martial arts and basic reading and writing, but also all sorts of abilities connected to army logistics and day-to-day maintenance. So if one is frugal one can save up enough to money to pay for the buy-in and leave the military altogether. Provided that they survive that long, obviously. Spies are usually two groups of people, who perform the same task - do the secret bidding of the Maps - with different levels of involvement. There are those who we might call career spies who keep some kind of front that seems to be their career, but truly their income comes from gathering information, spreading misinformation, stealing things, falsifying documents etc. And there are spies on the side. People who have legitimate careers, but willingly or not, perform services for the Maps, mostly in regards to gathering information and spreading misinformation. Both groups can operate domestically or in a different clan. The assassins are a secret military unit not controlled by the Maps. They answer to the agni herself and to the Field, the security sogn in particular. The Maps are not supposed not know the identities of the assassins. The assassins are warriors with a very specific skill set. They excel in stealth and silent killing methods. They should be small, agile and capable of using anything as a weapon. They are valued for their speed, accuracy, abilities to navigate unknown areas and to blend in with the crowd. They can also be skilled in traditional combat. They usually have a front career which serves to cover up their true vocation.